I'm posting this because I think everyone should have one in their car's glove compartment. 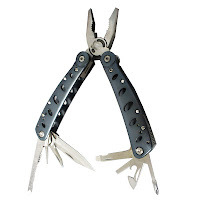 Get this Fury Attack Multi-Tool & Nylon Sheath for $10, and shipping is FREE. This is the lowest price I could find for this product online. Why should you have one? Because it's a tool kit in the palm of your hand. It includes pliers, a bottle opener, a serrated knife blade, another knife, a flathead screwdriver, drill, nail file, and cross screwdriver. Take it camping, on bike rides, to fix the sink... heck, I use the handle as a hammer in a pinch.